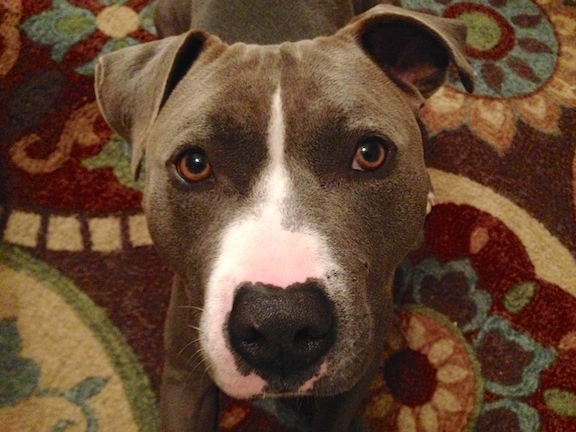 Cuda is a two-year-old Blue Nosed Pitbull who has developed a strong attraction to his owner’s cats and doesn’t always follow their commands or corrections. Cuda’s owners wanted to solve these issues before the arrival of their first child next year. I spent a few minutes observing Cuda as he interacted with his owners and their other dog. Cuda had a nice playful energy but showed his pit bull side by physically interacting with the dog and humans. I started out by standing up a few times to help define my personal space to Cuda who was rubbing, leaning on and pushing against everyone in the room. This is a classic bully breed trait and the primary reason I try to avoid physically moving or interacting with Pitts, boxers and related breeds. To these dogs, pushing when humans interact with them can be confused as play. The next time that Cuda got too close, I stood up and turned so my hips and shoulders were squarely facing him. He immediately stopped walking towards me, turned and walked over to where his owners were sitting. Before he got a chance to violate their space, I had them stand up in the same way to block him and disagree with his lack of respect for their space. I suggested that they repeat this technique each time the dog got too close. While there is nothing wrong with a dog being close to its owner, constant leaning and pushing them is a sign of lack of respect for their authority. It only took two corrections before Cuda understood and contently laid down a foot and a half away. By consistently defining their space this way, their owners will start to change the leader follower dynamic. To further develop the human’s leadership in Cuda’s eyes, I went over the concept of escalating consequences I like to us to disagree with unwanted behavior. Consistently disagreeing with unwanted behaviors this way will help Cuda’s owners interaction with their dog accomplish more with less effort and energy. It will also help them learn to better understand what Cuda is trying to say in other situations. Because there were some eating issues, I suggested that their owners adopt a structured feeding regimen with the humans eating first, while the dog waited with the food in their bowls. By asking the dogs to sit and wait for the humans eat a snack or full meal, we can help develop the ability to self restrain and also reinforce the leadership position of their owners. Once their owners finished their snack, I had them walk over and tell Cuda he had permission to eat. The other dog was not allowed in the kitchen while Cuda was eating to help create a relaxed, non competitive environment. As soon as Cuda was done, I had her owners ask her to leave the room before inviting the other dog in for his turn. Eating is a very important and primal activity to dogs. Because dogs eat daily, this is a great recurring leadership exercise that provides a nice incentive and reward to the dogs for for following their owner’s lead. This structured way of eating is a nice and easy way to help the dogs see and identify as being in the follower position. The more that Cuda sees himself this way, the more respectful the dog will be to his owners. As the respect increases, the dog’s response to his owners commands and corrections will do likewise.